We are delighted to announce the launch of a new novel, Anatomised, by author and Lyme sufferer, A.F. McGuinness who is also an active member in our LDUK Online Community. Andrew held this official launch in Canterbury on 3rd May and he shares with us how it felt to release his second novel after his own harrowing experience with Lyme disease. He was intereviewed by both KMFM news and Kent Online. We would like to thank Andrew for using his book launch as an opportunity to support our ‘Wake Up to Lyme’ campaign and we are very grateful that he will be donating some of the profits to LDUK. 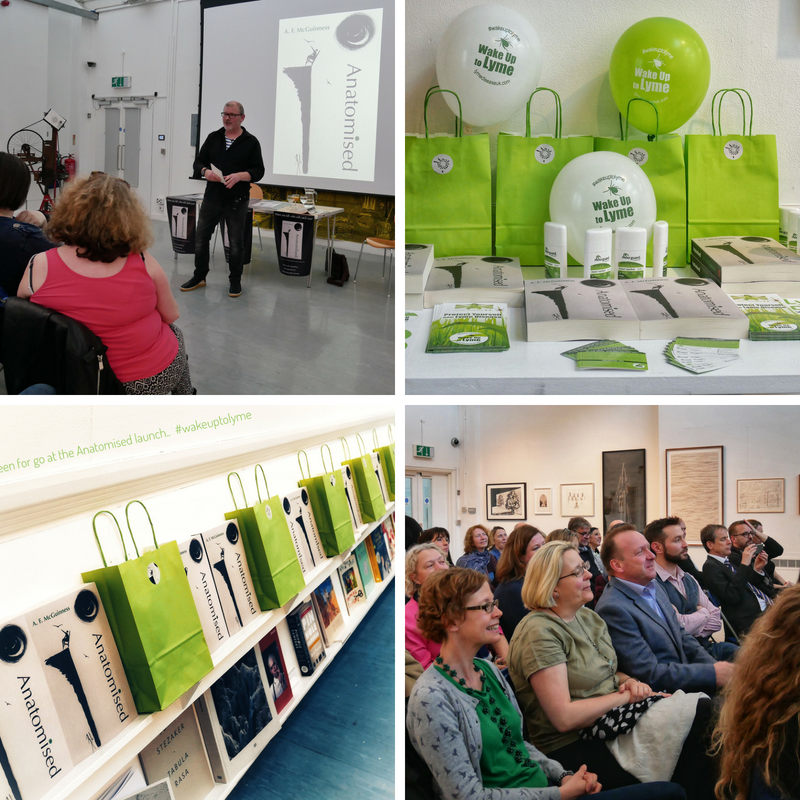 On Thursday 3rd May, I launched my novel, Anatomised, to a packed audience at the Sidney Cooper Gallery in Canterbury, Kent. Memories of the event will stay with me for the rest of my life; mainly because it was a book I thought I’d never be well enough to write (let alone launch), but also because the love in the room that night was so palpable! I’m used to interviewing novelists at busy events, but this time I was incredibly nervous, principally because it was my own work and Anatomised took so long to complete, and because it felt – still feels – incredibly personal. I needn’t have worried. From the preliminary multi-media presentation designed by my wife Janice (moving images, text and music based on the subject-matter and themes of the book, majorly Lyme disease) to the wonderful introduction by Paul Hendy (novelist, producer, filmmaker and early champion of the novel); from the support of friends and complete strangers who laughed, grimaced and cried in all the right places (the photos reflect this!) to the interesting questions raised by the reading, any anxieties I had gradually evaporated. Before I read from the novel, I thanked individuals and groups for their personal and professional support. Chief among these was LDUK. Not just for sending material for the launch night but for their support over the last five years. Natasha, Julia and Ann should be thanked individually, but really I thank the whole team and everyone who is a member of LDUK. It is a not-for-profit organisation that does so much for so many, which is why some of the profits from Anatomised will go to LDUK. I wrote the book to raise awareness, of course, but also to prove to myself that despite the harrowing experience of Lyme disease, and the devastation it caused, I could still get my life back on track. I could readjust and find a new normal. Humour was one of the first casualties of my Lyme disease. Despite the dark, I re-discovered my funny bone when writing this novel (with a comedian as a central character), so I’m overjoyed that readers are laughing and crying! Lyme disease is the one of the loneliest illnesses in the world. Like a leper from the seventeenth century, it doesn’t attract attention or adequate research funds (as many other diseases do). Many health professionals won’t touch it with a bargepole and a huge number of patients are left feeling isolated, alone and desperate. I have felt all of these things in my struggle. But over the years, especially during the last six months, I’ve come to fully realise the significance of Lyme patient support groups, their communities, and the power of patient advocacy. NICE may write the guidelines, but in the end we will write the book. I wish all fellow Lymies well. Genuinely well in the future. Much love and thanks again to LDUK. Visit AF McGuinness’ website here.